Like its predecessor, which was unveiled two years ago, the new Pivo has a cabin able to revolve 360 degrees, eliminating the need to reverse. The robot feature helps you to navigate and assesses when you’re tired and need to pull off the road. 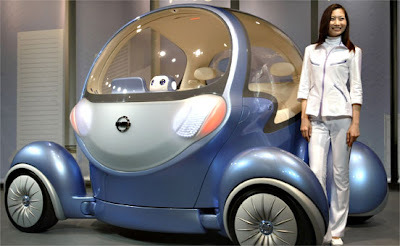 The company also claims it can sense when you’re angry and helps with road rage…by nodding or shaking its head. Whoa. Hold up. 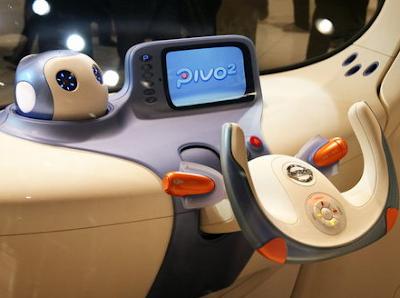 Admittedly, Pivo 2′s robot is adorable. But if someone’s screaming obscenities or laying on his/her horn or cutting me off in Friday afternoon traffic, there is no way that little guy bobbing his head is going to prevent me from giving somebody the finger and popping off at the other driver. Not unless Pivo’s robot comes with duct tape and some hand restraints, too.